Fixed Departures for the 3 styles of Chadar are available i.e. (Day-03) – Leh – Chilling – Tilath sumdo (By Road)–Shingrak. Night Stay in Camp near cave. (Day-04) – Shingrak – Muska La – Choumo Cave (By Trek) Night Stay in Cave / Camp. (Day-05) – Choumo Cave – Tipouma – Dib Cave – Nyrakpula Village (By Trek). Night Stay in Camp / Home stays in Village. (Day-06) – Nyrakpula Village – Lingshed Village. Night Stay in Camp / Home stays in Village. (Day-07) – Spend an entire day resting in Lingshed, one of the most remote villages in Ladakh. Visit monastery, school for monks and explore the village. Night Stay in Camp / Home stays in Village. (Day-08) – Lingshed Village – Nyrakpula Village – Dib Cave. Night Stay in Camp/Cave. (Day-09) Dib Cave – Choumo cave/Muska La. Night Stay in Camp / cave. 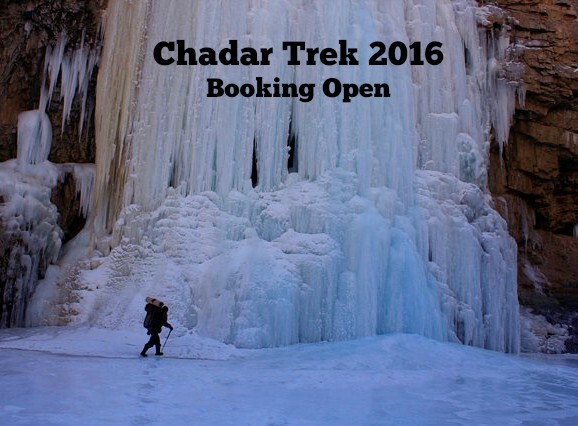 Itinerary :: Full Chadar Trek (14 Days including 1 back-up day). Arrive in leh. Transfer to hotel rest for acclimatization (strictly a Rest day). 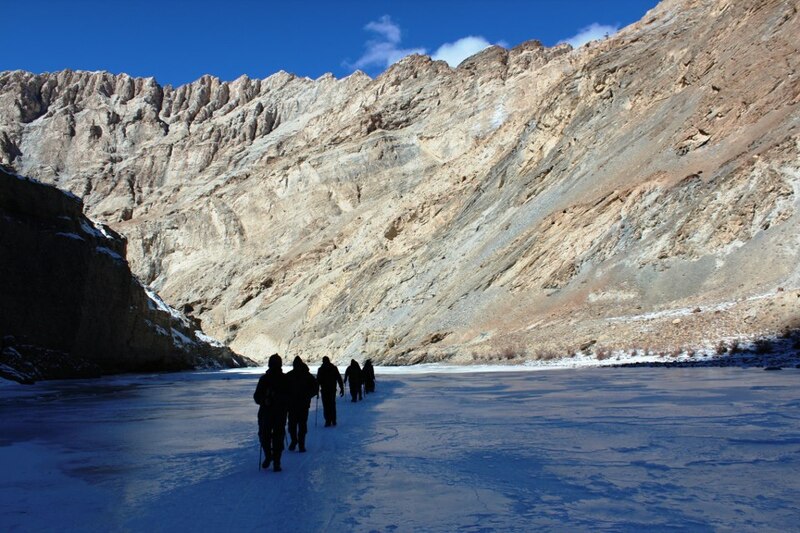 It takes about an hour to get used to the “ladakhi shuffle” of walking on the frozen zanskar. Boots with “sticky” soles are helpful as well as the poles. Practise walking in the afternoon. Camp at tilat sumdo. Leave camp by about 8.30am. Continue along the chadar to the cave at bakula bawo. It is believed that the first bakula rinpoche of ladakh spent a week meditating in this cave. A juniper tree above the cave is considered holy to the locals who traverse this gorge. Camp at shingra. Leave camp by about 8.30am. We stop for lunch at tsemodo for about an hour and continue to camp at tipp bawo. The water in this particular section tends to melt more easily and we may at times have to traverse the steep rocks due to the melting ice. If there is no proper campsite, we will go further to camp at gyalpo. – 3170m. Camp at tipp bawo. This can become a difficult day if the chadar is not very firm. The scenery though is stunning as we pass incredible frozen waterfalls which look like ice cliffs. If you look closely chances are that you will see blue sheep, ibex clinging onto the cliffs. Stop for lunch enroute at yokmado near one of the many caves used by the zanskaris at night and continue to walk on the chadar to camp at nyerak pulu. The village is high above the river. (if the chadar is in good condition this walk will take about 6 hrs otherwise it may take upto 8 hrs). Camp at nyerak. 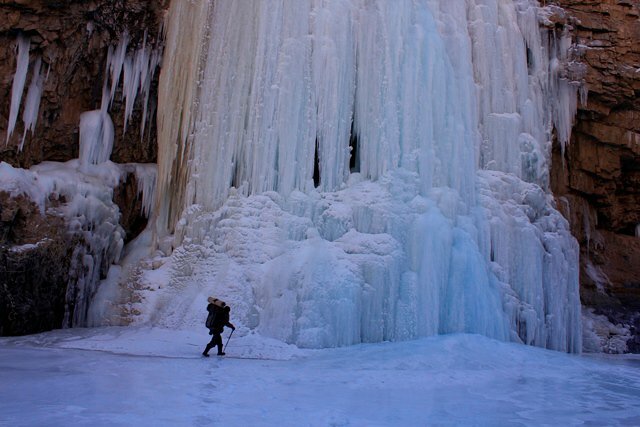 Visit the monastery in the morning then trek for 2 hrs through the valley before reaching the frozen chadar. We then begin our walk on the frozen river to tsarak dho. 5 – 6hrs and from there the will pickup and drive to centre of the Zanskar region Padum. We will walk around the Padum and stakrimo gonpa and visit the the karsha monastery and the village karsha by jeep. Day 13: fly to Delhi. Yap, looks good.. i have done few treks in hims max alone, but going in group will always be fun, thanks, and iam interested, you can mail me the other details…. or you send me your email id and I will send you the other details. Hi, I’d like to know the details, too. please send me your email id so that I can send you the details. Hi Rohit, hv been doing Nubra and Spiti on my bike for the last many years. Howver, this is the first time that I look forward to a trek. Count me in punk. What do I do to join and not skip it? I have mailed you the details.